This unit is privately owned and you are renting directly from the homeowner whose company name is Kauai Islander 224-25 (as will appear on your credit card statement), Hawaii Transient Accommodations Tax ID TA-136-447-5904-01, General Excise Tax ID GE-136-447-5904-01. Reservations are therefore non-transferable between other units. Check-in time is 3 PM and checkout time is 10AM. You will receive an email from kauaiislander224n5@gmail.com with the comfirmation of your booking. Please add that email address to your contact so that the email will not be treated as spam. • A security deposit of $600 is also required and will be authorized on your credit card 7 days prior to arrival. A charge may result for damage to the condo, missing contents, keys, or for exceeding the maximum number of allowed overnight guests. • All stays have a checkout cleaning fee of $160. Stays of more than 10 days have additional mandatory interim cleaning fees of $160. For example, if you had reserved the condo for 28 days, there would be two interim cleanings during your stay. One on the 10th day and one on the 20th day, as well as the checkout cleaning after you checkout. • There is a $40/hour charge for excessive cleaning, beyond standard checkout cleaning. Our guests DO NOT pay resort fees. As a result, our guests will not have some of amenities that guests who pay resort fee would have. The services that our guests do not have are: 1. no access to laundary room; 2. no services from the lobby except picking up the parking permit. Our guests do have access the pool, the pool bar, and the BBQ area. • Smoking is strictly prohibited in the condo or on the condo lanai and doing so will result in full loss of security deposit. We have covered lanais, so the smoke gets trapped and blows into the unit. If you smoke away from the unit on the grounds, please be sure the dispose of your cigarettes appropriately, but not in the condo. • NO portable appliances of any kind, such as grills, electric stove, etc., are allowed to be used in the unit and lanai. Use of portable appliances will result in forfeiting the entire amount security deposit. • We charge a fee of $25 for any missing beach or bath towels upon checkout. • We provide sheets for each bed and two bath towels per stated guest. There is no daily maid service. If you have an interim clean included with your reservation we will launder the linens during the clean. • Guests are required to report any damages immediately to on-island contact Monica Labuguen at Monica@howaiicareandcleaning.com, phone 808 635-8589. The OWNER IS NOT RESPONSIBLE for any accidents, injuries or illness of the guests that occur during their stay on the premise or its facilities. The OWNER IS NOT RESPONSIBLE for the loss of personal belongings or valuables of the guests. Loved our stay in rooms #224 &amp; #225. The rooms were very clean and well organised to best use the space. The view was fantastic and we saw some whales jumping out front. These rooms were equipped with everything we needed. We used the Tommy Bahama beach chairs everyday. After a long day it was nice to come back to a/c or sometimes I just turned it off and opened the balcony door - there was usually a nice breeze flowing. I really didn't think it would be as nice as it was as I have been disappointed in the past on other condos but there was nothing I would change here! Doors Connecting two condo units 224 and 225 from Inside. Each unit can be booked separately. You are right on the beach front! From the room, you have an unobstructed view of the waves, as if the waves were coming to you. You have a table with 2 chairs. You have an even better view of the ocean. You can feel the cool trade wind breeze, and smell the salty air that only an ocean front can provide. One working table plus two chairs. Two king sized bed. The rooms sleeps up to 4. The kitchenette has a bar sink, microwave, bar fridge (no freezer), and coffee maker. We also provide plates and silverware, paper towels, napkins, dishsoap and a sponge. Ice machines are available in the compound. The full bathroom has a tub/shower, spacious vanity, excellent towels and basic bath amenities. There is also a built in hair dryer. One sofa plus a small table for drinks. One working table plus two chairs. One queen size bed, plus the sofa which is a pull-out full-size bed. The room sleeps up to 4. We are on the east side of the island, with easy access to both the south and north shores. Coconut Market Place is within walking distance for shopping and food. Wailua River is close by. 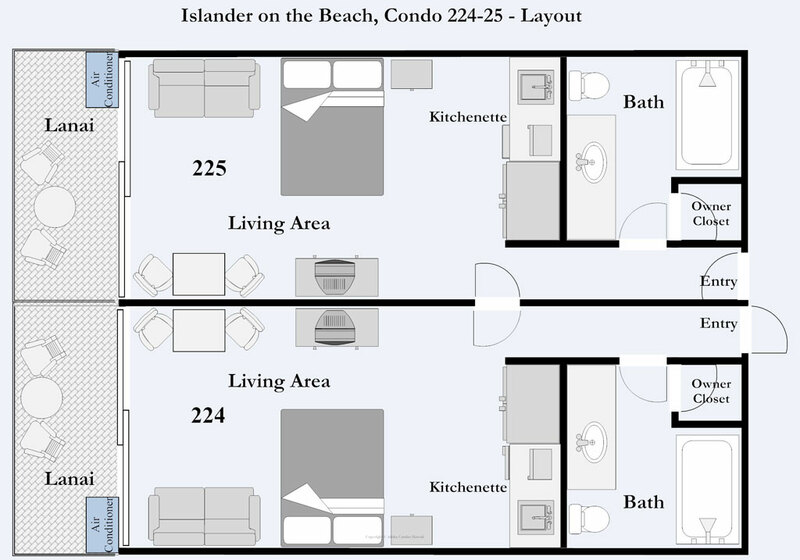 Two studio units each with a queen sized bed and full sleeper sofa. Full bath and kitchenette equipped with bar sized refriderator, microwave, toaster oven, coffee maker and blender. Fantastic ocean views! Stayed in Islander on the Beach 224-225 and enjoyed the awesome beach front views! Lovely sunrises every morning, beautiful grounds, pool, cabana bar. Walking distance to restaurants and stores. Glad to have the AC, but loved going to bed each night to the sound of the waves crashing against the shore. We have been vacationing on Kauai for 30 years and will come back here again! Great place to stay , good value for the price of the condo. We stayed at Islander on the Beach . It is beautiful there , everyday they are out working making sure the grounds are perfect. There were so many flowers and plants and lovely plumeria blooming. The ocean was right there , no having to drive somewhere to see its beauty and listen to the waves and see the sunset . The room we stayed in was very clean and comfortable ,we had everything we needed . One night we had BBQ and used the grills near the pool and had drinks later at the Tiki Bar . Coconut market next door has lots of shops to go thru and a few places to eat , we loved Eggburts for breakfast . The location is great also , right in the middle so the places we wanted to visit weren't very far . There are so many places to visit in Kauai, make sure you check out trip advisors top places to visit and Pinterest was good also . I also read other places reviews not because I was looking for another place to stay but people would tell you where they went and what they liked and didn't like. When we decided to visit Kauai again it was nice to already know where we wanted to stay. The only complaint I read about was parking , we didn't have a problem . If we decided to stay out later I the evening (which is when parking was sparse) we would get a pass to park next door it was a 2 minute walk .. No problem at all. We can't recommend this place enough , very affordable and just a lovely place to stay . Loved our stay in rooms #224 & #225. The rooms were very clean and well organised to best use the space. The view was fantastic and we saw some whales jumping out front. These rooms were equipped with everything we needed. We used the Tommy Bahama beach chairs everyday. After a long day it was nice to come back to a/c or sometimes I just turned it off and opened the balcony door - there was usually a nice breeze flowing. I really didn't think it would be as nice as it was as I have been disappointed in the past on other condos but there was nothing I would change here! Totally equipped with everything you need plus providing a gorgeous view. The grounds were very well kept and beautiful. The staff was very friendly and helpful. Coconut Market had unique stores. Wow! Way better than we thought!!! The condo exceeded our expectations & the pictures didn't do it justice. Very clean & quiet. We were concerned about the parking mentioned by others but don't let this stop you from booking, the on-site security assisted you with parking if you arrived late so it was never a problem. To wake up and be oceanfront on your own lanai is incredible. The sunrise from the lanai was also an added bonus & surprise. The pool area is great and was never crowded. You can't beat the rate or the location, we will book again! It was a great experience & vacation.